Leslie Harrison Dam supplies about 25% of Redland City's drinking water. It is one of a number of dams in South East Queensland to be upgraded as part of Seqwater's Dam Improvement Program. The $24m Leslie Harrison Dam upgrade will strengthen the dam wall and spillway to improve safety. The project is expected to be completed by mid-2019. Here you can find everything there is to know about the project, along with construction updates and other important news. You can also contact a project team member to ask questions and find out more information. Putting the final touches to the new conduit (tunnel) that carries the raw water pipeline from the dam to the water treatment plant. Finishing the new access shaft that will allow maintenance workers to access the conduit. Finishing the weighting berm downstream of the dam wall with earth fill. Widening the dam wall with new sand filters and earth fill. This will improve the strength and stability of the dam wall. Did you know the temporary bridge over Tingalpa Creek has carried more than 12,000 loads of construction materials to the dam upgrade site? The temporary bridge has reduced the impact on the Capalaba community by keeping those trucks off local streets and away from Capalaba State College. You know those paint tins full of jelly beans? If you had 1 jelly bean for every truck that has crossed the temporary bridge you would have 12 four litre paint tins! As construction continues you can expect minor disturbances associated with construction. Every effort will be made to minimise impacts to local residents however, some noise is unavoidable. Work hours are 7am to 5.30pm Monday to Friday and 7.30am to 2pm on Saturdays, when required. The temporary bridge over the spillway is now complete and is being used by trucks and other heavy vehicles to access the work site. Trucks are entering the site from Dam Road off Mount Gravatt-Capalaba Road. Want to se how we built the temporary bridge? Check out this video! There are changed traffic conditions on Mount Gravatt-Capalaba Road near the interchange with Moreton Bay Road. Trucks will be accessing Dam Road between 7am and 5pm. Please drive with caution and observe all signage in place. Dam Road is only accessible to construction vehicles. The completion of the bridge means that only light vehicles (personal cars and utes) will be regularly using Larbonya Crescent and Willowie Crescent. These local roads will remain a backup contingency route for other vehicles to access site if required, such as during maintenance on the temporary bridge. In 2014-15, the water level at Leslie Harrison Dam was lowered and the gates were removed to reduce the water load on the dam. Detailed investigations were conducted to identify a preferred solution to address the dam improvements required and meet Queensland Dam Safety Management guidelines. Following detailed investigations, the decision has been made to upgrade Leslie Harrison Dam and maintain its current full supply level once work is complete. A number of tools have been developed to help you learn more about Leslie Harrison Dam, its history, how the dam operates and plans for the future. During community consultation earlier this year, Seqwater made a commitment to share summaries of the contractor’s Environmental Management and Traffic Management plans. Both of these plans are now available in the document library on this website. These plans identify how Fulton Hogan has responded to community concerns including safety around Capalaba State College, impacts on nearby residents and impacts on the environment particularly to native wildlife. Seqwater has appointed an experienced contractor, Fulton Hogan, to undertake construction. Work is expected to take up to 12 months to complete. The $24m Leslie Harrison Dam Upgrade will strengthen the dam wall and spillway to improve safety and is expected to be completed by mid-2019. Increased traffic, including delivery trucks, on local roads. Most construction traffic will access the site via Dam Road, off Mount Gravatt – Capalaba Rd, and a temporary bridge across Tingalpa Creek from mid-July. Temporary traffic management on local roads as required to maintain the safety of both the community and construction workers. Minor disturbances associated with construction work, such as noise and dust. No change to existing Seqwater operations, including the Capalaba Water Treatment Plant. All works will take place between 7am and 5.30pm on weekdays and between 7.30am and 2pm on Saturdays. Construction workers will also be travelling on local roads for half an hour before and after work hours. Fulton Hogan has established a community hotline and project email account for enquiries or complaints. Dam Road will be the primary construction access route during the upgrade. This route is expected to be open from mid-July. Until then, all vehicles will use the existing access to the Capalaba Water Treatment Plant via Larbonya Crescent and Willowie Crescent. The crossing of Tingalpa Creek will use a temporary bridge structure, similar to those used by the military and for humanitarian and emergency access routes. This will reduce the environmental impacts associated with the creek crossing and the probability of inundation from spillway flows. The temporary bridge structure will be 55m long, about the length of four and a half city buses, and will safely transport 44 tonne trucks from Dam Road to the work site. The temporary bridge structure will be higher and more resilient than a typical creek crossing, but will still be unsafe to use during large flood events. Site establishment works will take four to six weeks. Heavy construction is expected to start in July. We will keep the community informed of progress with the project and any expected impacts. We appreciate your patience during these essential works. The impact on traffic on major roads and local streets. The impact on residents living near construction access routes. The impact on the environment, especially wildlife. The impact on safety, particularly for pedestrians. A fifth recurring concern was recreation on and around Leslie Harrison Dam, however feedback included comments both in favour of and opposed to the introduction of recreation. You can read the full report on community feedback here. The next step in the decision making process is to meet with local council officers to discuss the approval requirements, proposed traffic routes and community concerns. A decision on preferred traffic routes and traffic management will be made in conjunction with Brisbane City Council and Redland City Council. Additional investigations will be made to inform these decisions. This is likely to include engineering works, environmental surveys and geotechnical (soil) surveys, and may be completed on all proposed routes. We will provide regular updates to the community about progress with investigations, planning and decision making. Summaries of the environmental management and traffic management plans will be published on the project webpage and shared with residents near the access routes. The easiest way to stay informed of progress with planning and construction is to subscribe to email updates. 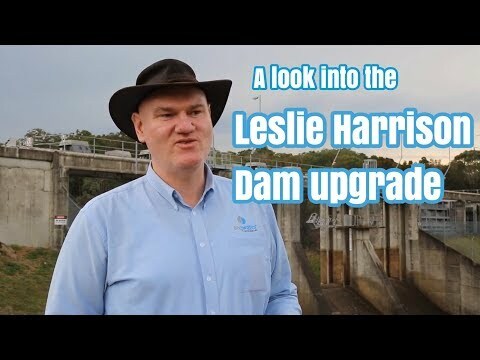 Click here to play video Take a look into the upgrade of Leslie Harrison Dam Chief design engineer explains the Leslie Harrison Dam improvement works. 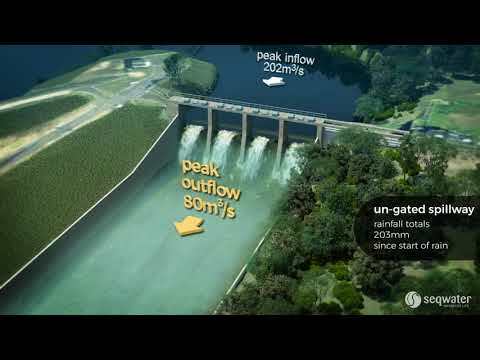 Click here to play video Gated vs un-gated spillway at Leslie Harrison Dam Watch a simulation of Leslie Harrison Dam during ex-Cyclone Debbie in 2017. You can find up to date information on current dam levels at Seqwaters dam level page. You can also sign up for our free dam spill notification service here.